PennsylvAsia: Japanese Language Social Hour, September 18 at Pitt. 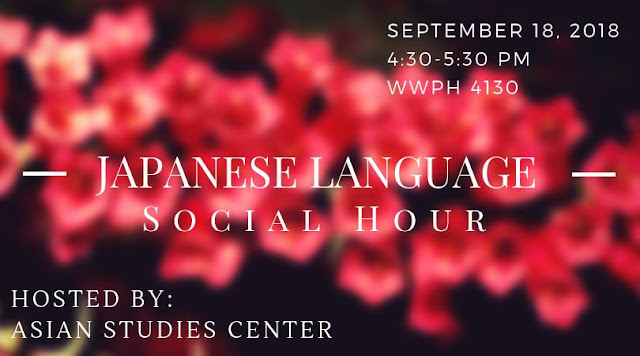 Japanese Language Social Hour, September 18 at Pitt. Interesting in practicing your Japanese language with native speakers? The Asian Studies Center is partnering with students from Yasuda University in Japan who are studying English at Pitt's English Language Institute. We will organize a series of games to encourage Japanese/English conversations and hopefully many participants will find a language partner. Please join us on Tuesday evening September 18 at 4:30 pm in 4130 Posvar for an evening of language and culture exchange. Free pizza and drinks will be provided. Please email asia@pitt.edu if you are interested in attending.